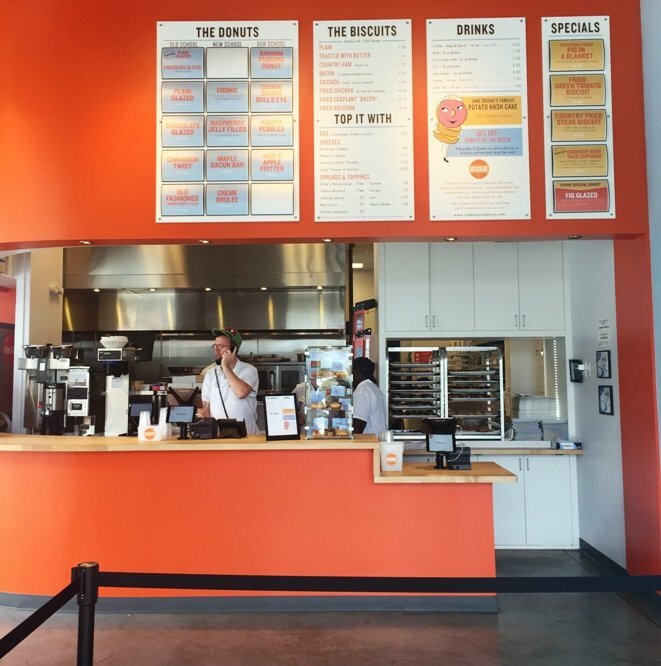 First Take: Rise Morrisville and Cameron Village for Better Biscuits and Donuts! 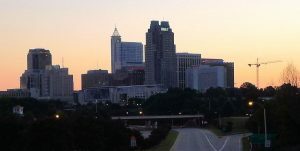 The Rise location in Morrisville is in the very large and expansive Park West Village complex and across from the popular Blaze Pizza. From the outside, Rise Morrisville looks just like the Durham spot and inside, it’s about the same too! 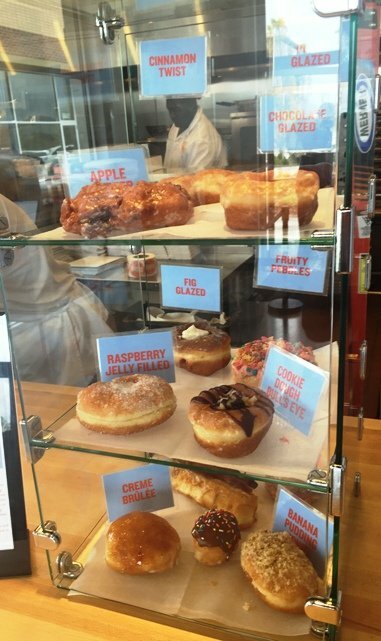 A display case of the day’s donuts tempts the eyeballs, I’m keeping it simple today. One cronie (croissant donut) and one creme brulee donut, my fave. The tab for these goodies runs me about $6 so I grab a glass of water to wash it all down with. The seating set-up here at Rise Morrisville is similar to the Durham location. Not much inside except for a strip of chairs by an eating bar with a narrow window to peek into the kitchen. However, Rise Morrisville also has an outdoor patio (that may be shared with other businesses) for when the weather is good. 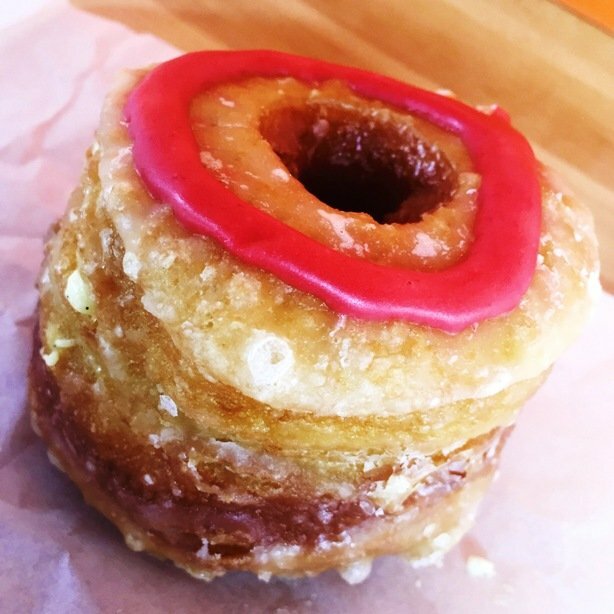 The cronie is a beautiful pastry with a bright pink raspberry swirl on top and sugar crystallized coating. I bite in and it’s a lot denser than expected but tasty. I save the creme brulee donut for later and it’s ok. So in my head I’m wondering if my expectation was too high since it’s been a while since my last Rise visit. Or maybe the franchises may be a bit different depending on the owner? 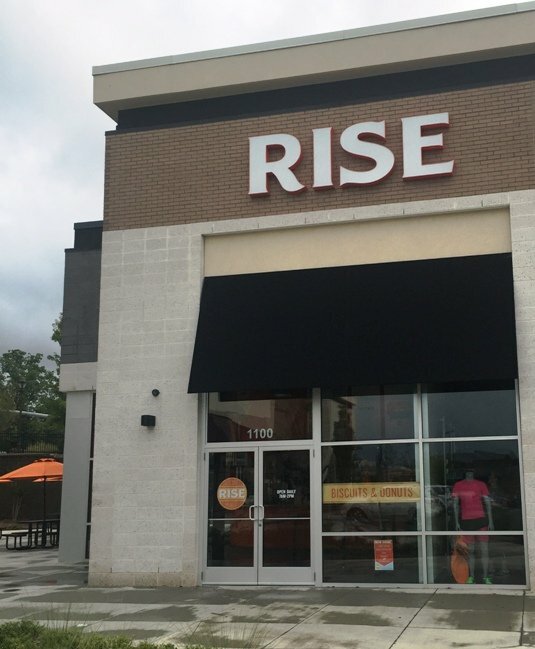 Moving a bit closer to home is the new Rise location in Cameron Village. Conveniently located, it’s on the northern side of the Cameron Village plaza, about 1/4 mile from my condo! It’s a small and tidy spot with no window into the kitchen but you can look directly in from the front counter to watch the frenetic action. As you can guess, I’ve stopped in a couple of times since they opened up in December and it’s all been really well done. While I do love my donuts, what has caught my attention here at Rise Cameron Village is their biscuits. 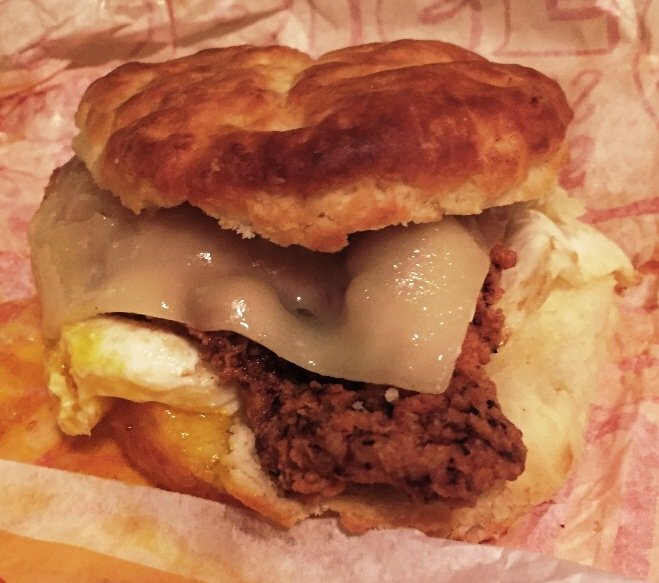 Don’t miss out on their fried chicken biscuit, I add a runny egg and hoop cheddar and it’s a totally delicious and caloric brekkie sammich. I’ve also done their sausage, egg, cheese biscuit and their pig in a blanket which are both excellent. 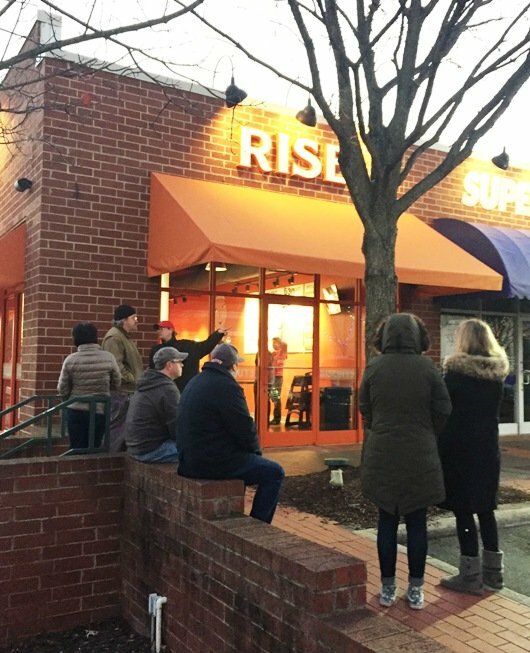 Rise Cameron Village also has a small outdoors side patio if you can’t wait to dive into your biscuit! Overall I’m impressed with the goods here, more so than the Morrisville visit. So there may be some variation amongst Rise franchise locations in terms of the eats. But what I can tell you for sure is that the new franchise locations feel and run just like the original which should be a good thing. 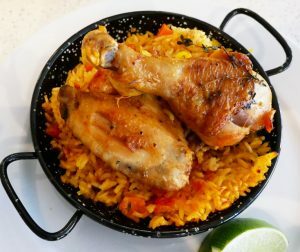 The basic menus are near identical but they do vary a bit with their daily specials so check out the website or their Facebook pages. I’ll need to try Morrisville again to make sure the pastries have made it through intact with this whole franchising model. 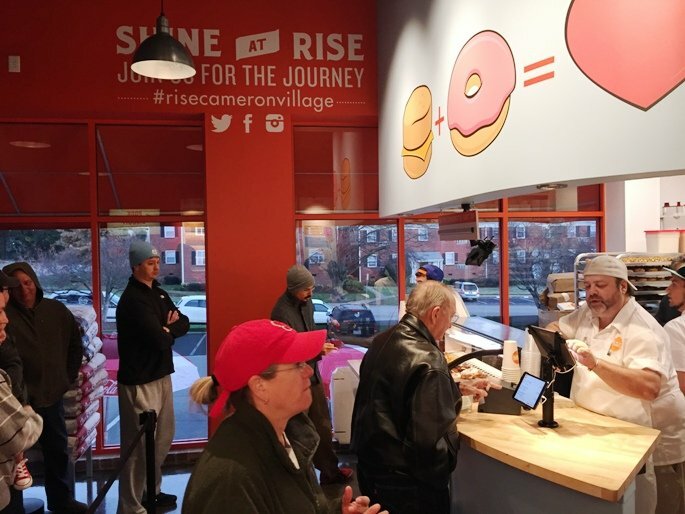 But for the most part, the new Rises in both Cameron Village and Morrisville are doing a great job in upping the biscuits and donut game here in the Triangle. 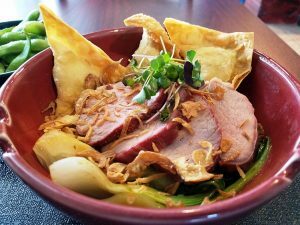 I guess I need to hit up the last new location in N. Raleigh now, woohoo! Hi Ron. Thanks for the review. Can’t wait to see you at our N. Raleigh location soon!! Thanks Mehul, have heard good things about Rise N Raleigh! Looking forward to visiting….